Agriculture continues to play an important role in most non-industrial economies, as a major contributor to the countrys export earnings and as a source of employment and livelihood. Official statistics often underestimate the value of womens work and their overall contribution to national wealth. Women continue to provide a large proportion of the labour that goes into agriculture. FAOs estimates show that women represent a substantial share of the total agricultural labour force, as individual food producers or as agricultural workers, and that around two-thirds of the female labour force in developing economies is engaged in agricultural work. FAO has noted that while the overall proportion of the economically active population (EAP) working in agriculture declined during the 1990s, the percentage of economically active women working in agriculture at the global level remained nearly 50 percent through 2000, with an even higher percentage in developing countries (61 percent) and in LDCs (79 percent). Furthermore, although FAO projections to 2010 indicate a continued reduction in the overall female participation in agriculture globally, the percentage of economically active women working in agriculture in LDCs is projected to remain above 70 percent. 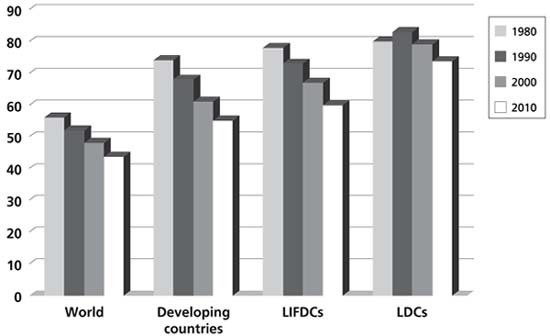 The chart below compares FAO estimates of the proportions of the female economically active population working in agriculture, first at the global level, and then for developing countries, low-income food deficit countries (LIFDCs) and the Least Developed Countries (LDCs). Part of the overall decline in the percentage of economically active women in agriculture globally is attributable to the greater involvement of rural populations in off-farm employment, in addition to the ongoing increase in migration to urban areas. Yet what is generally clear from the FAO data is that, as an aggregate, the low-income countries of the world - where agricultural production is still labour-intensive - also tend to have the highest percentages of economically active women working in agriculture, particularly in the LDCs. These percentages are also linked to an increase in male migration to off-farm activities, with women either assuming more responsibility for the family farm or for increased production of cash crops and food processing activities in order to increase family incomes. The female contribution to the overall economy is high throughout Asia and the Pacific region, particularly in terms of labour input into agriculture. Bangladesh, Bhutan, Cambodia, China, India, Myanmar, Nepal, Pakistan and Vietnam have particularly high percentages of women employed in the agricultural sector, with estimates ranging between 60 and 98 percent. Indeed, in most Asian countries the number of women employed in agriculture as a percentage of the EAP is higher than that of men. As FAO reports, "this finding is even more significant given that data for the economically active population in agriculture tends to exclude the unpaid work by rural women in farm and family economies. If unpaid work were included, the figures for female employment in agriculture would be even higher." Recent research has also shown a trend towards higher female participation in agriculture in Latin America. A significant increase over the past two decades in the number of rural Latin American households headed by women has been noted; these women are usually the primary source of income for their families, and are typically involved in agriculture. Poverty levels have also increased in Latin America, from 60 to nearly 64 percent between 1980 and 1999, with the absolute number of people living in poverty having increased; while the number of women working in agriculture (both subsistence and commercial farming) increased from 15 to 20 percent between 1990 and 1999. The relative lack of gender-differentiated data precludes a full assessment of how gender may be related to increased poverty and female-headed households in Latin America. Various studies have concluded that the social-institutional constraints faced by women - in terms of equal access to economic opportunities and productive resources such as land, credit, technology and market information - tend to make them more vulnerable than men, broadly-speaking, in managing risks arising from economic shocks. In the Caribbean, data for the involvement of women and men in agriculture are generally confined to transactions in the formal market sector. Statistics relating to the production and marketing of the principal export crops, such as banana and sugar, indicate that men are predominant in the control and marketing of export or cash crops. For instance, a social audit completed in 2002 of the sugar industry in St. Kitts indicated that men, by a three to- one ratio, were its primary source of labour. A similar ratio prevailed in the marketing of banana. Women, however, are highly visible in the production and marketing of food for domestic, household consumption and tend to participate in regional export trade of food, buying directly at farmgate and exporting to neighbouring islands, for example from Grenada and St. Vincent to Trinidad/Tobago and Barbados. Women in agriculture in the Caribbean, as in most developing countries, play important roles in household food security as income earners, nurturers, and managers of natural resources and biodiversity, although the success with which they are able to execute these roles is often mitigated by restricted access to land, labour, capital and technology. In Jamaica, for example, the majority of women farmers - principally engaged in food production for domestic consumption - are smallholders, with the average farm size being significantly smaller in area than that held by men. In that country, then, production constraints related to land tenure and access clearly tend to impact more heavily on women than on men. And research indicates that, while women are predominant in domestic and/or regional sphere of agricultural marketing, men typically are more actively engaged in the marketing of traditional and nontraditional agricultural commodities to extra-regional and international markets. In most regions of the world, women tend to be ultimately responsible for children and other dependants, and are often responsible for household food security. Female-headed households, both de jure and de facto, are on the increase globally because of internal and external migration, civil conflict, disease, and disruptions to traditional family structures. But whether or not a male spouse is present in the household, in most societies women are responsible for food processing and preparation, providing and obtaining health care, and clothing their children. Increased out-migration by men, leaving women with sole responsibility for their families. Increased economic vulnerability to global market forces as traditional foods become less economical to produce, rural incomes decline, commercial agriculture becomes more input-intensive, and productive resources are dominated by agribusiness. Local and regional crises, such as civil conflict and HIV/AIDS, leaving women to care for orphaned dependants. Food security and family well-being are clear reasons for protecting or enhancing womens access and control over land and other productive resources. Studies have shown that resources controlled by women are more likely to be used to improve family food consumption and welfare, reduce child malnutrition, and increase overall well-being of the family. The necessity for thorough assessments of how trade liberalization may or may not impact on food security, nutritional status and/or access to agricultural inputs and other productive factors - from a gender-differentiated perspective - should be seen in this context. Creating such assessments is crucial to the successful development of any programme or policy ultimately concerned with improving food security or poverty alleviation. Women have always worked in the production of food and other products in rural areas. However, official statistics are determined by reporting in line with official definitions of agricultural work, which tend not to recognize womens contribution to agricultural activities, despite efforts to improve gender-differentiated data in agricultural census and household surveys. FAO, Gender, Key to Sustainability and Food Security, Plan of Action: Gender and Development, Rome, 2003. Rural Women: Key to Food Security, Gender and Population Division, FAO, 2003. Within these studies, the following can be mentioned: Blumberg, 1991; Von Braun et al., 1994, and Hirschmann, 1984.